Two of the United Kingdom gambling companies announced that they finally managed to complete their merger. This created a new giant in sports betting and casino games which will be available via various jurisdictions and multiple channels. Ladbrokes merged with several of the Gala Coral’s brand under a deal worth multi-billion pounds. Some of those include Eurobet Retail, Coral Retail, and the company’s online division. The merger is effective from this morning. Two days ago, Ladbrokes announced that they changed their name to Ladbrokes Coral Group plc. In high anticipation of the completion of the deal. Jim Mullen, who was Ladbrokes CEO, will continue his reign as the company’s new entity. After the deal had been finished, he said that this would be an exciting new journey for the combined operators. 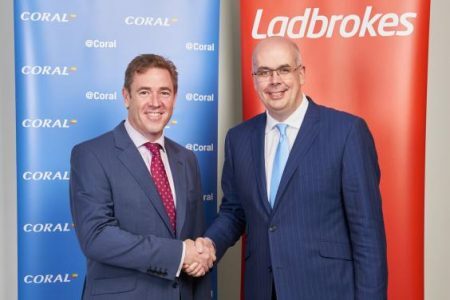 Carl Leaver, who was Coral’s Chief Executive will now be the Executive Deputy Chairman at Ladbrokes Coral. It is now official that Ladbrokes Coral is the current owner of the country’s largest chain of betting shops. The company will manage over 1700 outlets across the nation. These were the main reason for the operators to merge. The deal was actually announced last summer. However, it took over one year to seal. The Competition and Markets Authority argued that the company would have to sell up to 400 stores. Otherwise, a single company would own too many betting shops in one area, and that would leave the gambling customers with a limited choice. The companies agreed to sell 360 stores last month, to prevent the new giant operator to be closed after one year of negotiations. Follow our Latest news section for more articles.